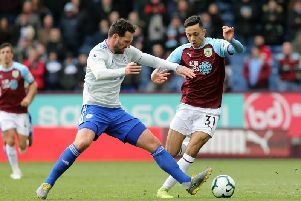 Belgium midfielder Steven Defour has been ruled out of Burnley’s Premier League encounter with Everton at Turf Moor on Saturday (kick-off 3 p.m.). The 28-year-old suffered a hamstring injury in the 3-1 defeat at Southampton on Sunday. And although Defour’s injury is not as bad as first feared, boss Sean Dyche confirmed he will miss out on the chance to take on international colleagues Romelu Lukaku and Kevin Mirallas. Dyche said: “Steven Defour has a hamstring, but it’s not as bad as what it could have been, which is good news. “He won’t be fit for this weekend, he definitely won’t be, but we’re thinking he will be a lot quicker than what we first thought, so we’re pleased overall. Burnley face Ronald Koeman’s side looking to build on a decent start at home, which has seen them collect all seven of their Premier League points, beating Liverpool and Watford. Dyche admits his side are “a work in progress” on the road, but they are a different proposition at Turf Moor: “We’re happy with how it’s gone at home, our form is very healthy there, seven points is a solid start, and we were two referees’ decisions, against Swansea and Arsenal, away from nine or more.